Ezi Solution are pleased to announce the availability of Version 2.0 Retail-Man POS software, which includes inventory control and accounting. 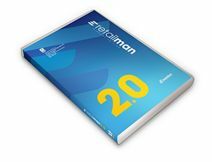 This is the first major release of Retail-Man Point of Sale for more than 3 years, There have been many minor releases. Pricing of licence keys, upgrades and support have been revised for Version 2.0. The cost of a new licence key starts at US$299 for a 1-user system. Upgrading to Version 2.0 costs from US$70 for a 1-user system. Please see the link below for more details. More features will be added to Version 2.0 over the next year, but some changes to version 1.90 are listed below. The evaluation period has been extended from 30 to 90 days worth of transactions. Use of Visual FoxPro 9.0 instead of 8.0 which has better support for external libraries that are needed to add to make the system more functional. The reports have been changed to run in the new version. A new security procedure to give more control to the licensing options, so now we can have a Demo version, a Temporary version and a Full version all controlled by the product key. You will need to have purchased a licence key for Version 2.0 before upgrade. can I use evaluation version of 2.0 to update the current software and see how it works in my shop for the trial period of 90 days and then decide to buy? also what is the new function has added in the ver 2.0? Currently reviewing and evaluating the version 2.0. Again, it seems like the database for storing item cannot accept any of the East-Asian characters, such as chinese, japanese, korean, etc. When i tried to add new item and inputted chinese, japanese, korean characters into the item description, it displayed ???? I have switched the system locale to Simplified Chinese and downloaded the chinese language and still doesn't work. I want the item description to be able to display chinese characters. The menus are of no importance to me. Have tried other POS software as well. It seems only Quickbook POS is able to display chinese characters in the item description for stand-alone POS. Almost all web-based POS are able to display item descriptions in chinese characters. It seems like the database you are using doesn't support chinese characters or i might be wrong. China, being the 2nd largest economy in the world, and most of my clients are from China who only read Chinese characters. Thus, being able to display chinese characters in item description is of utmost importance for me in selecting the POS software. I've been using Retailman for years and loving it. As my business grows and gains more clients from China, I'm currently looking to upgrade my POS software that have the above feature. It will be great if Retailman can add the above feature. Otherwise, it's time to board the ship for Cloud-base POS. We have seen some customers having issues using Version 2.0 when Chinese is the default language. The error seen is below. We have just updated Chinese.zip to include two extra files that we believe should fix the problem. See the link below for details of how to download and install.